Going about their business. A typical day in Carlsbad. A typical scene on the beach. Saw two ground squirrels on the cliffs; we think we can identify their burrow entrances. Several lizardy gecko creatures out sunning and suddenly zipping about. The pelicans zooming not too far overhead in their formations, back and forth. The sandpipers skittering, the gulls crying. The surfers looking awkward or graceful. The kids scampering and frolicking. The sandcastles melting in the waves. The stones and shells in abundance. We tried to estimate how many stones there are on our stretch of beach. Millions. Maybe billions. There were over 100 in a square foot, and there are lots of areas — yards and yards and yards — where there are piles, heaps, waves of stones, a foot or more deep. 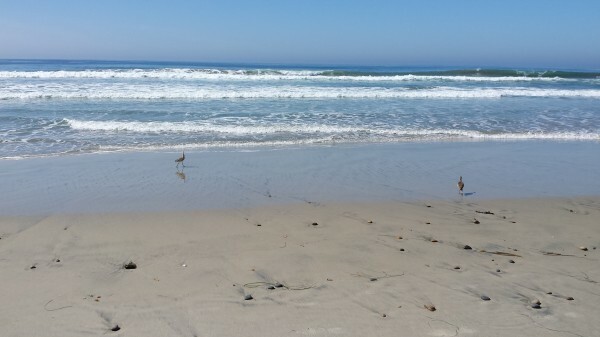 Carlsbad has seven miles of beach. Unimaginable numbers of stones. Then multiply by trillions for grains of sand. All beautiful! We are so fortunate.